While we think of rats and humans and oak trees, the species that really catch our imagination are actually the majority of named plants and animals- that are rare! That particular fact normally escapes us, but it's true. Obviously the rare ones are vulnerable and liable to become extinct in the blink of an eye. Scientists and layman alike have always assumed that one species lost will not impact a whole system, but apparently it doesn't work like that. The functions of these "rare ones" are to support long-term and large-scale parts of the maintenance. Without them whole sections of species collapse, according to this research from David Mouillot of the University of Montpellier and many other eminent biologists from the US, UK, Australia as well as France. Between 63 and 98% of coral reef fish species that perform special functions on the reef are rare while in the jungle, only one tree per sample was recorded for 55% of these special species and the same goes for alpine plants. Only these three ecosystems were chosen so as to limit the task and use the most diverse examples. The functions performed by the special species are not easily defined but are thought to include degradation, bioturbation, bioerosion and other links to productivity. 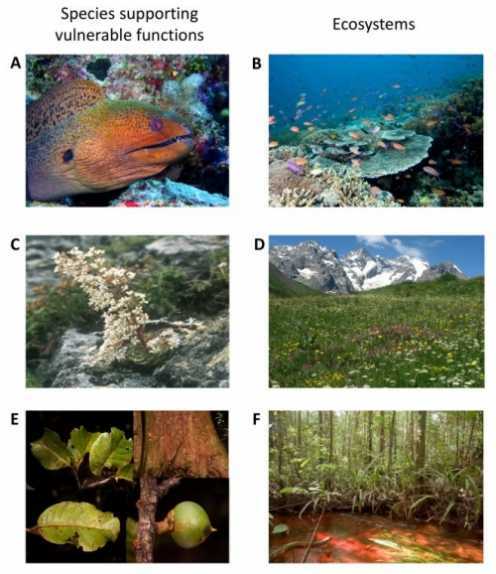 While frequent studies look at links between specialisation and rarity, here combinations of traits that support the ecosystem were displayed by are species. The answer was that highly distinct combinations are mainly supported by rare animals and pants. Datasets from the 3 ecosystems studied showed these combinations were using these species in all three, especially with the most vulnerable jobs in the ecosystem. Both local and regional results illustrated the result favourably. The examples from alpine meadows were a saxifrage, Saxifrage mutate, and the evergreen rose of the maquis, Rosa sempervivens. They obviously performed in areas that the authors define as special, vulnerable to their loss and important for other species to function. On the reef Gymnothrax javanicus (a giant moray eel), had the fifth highest "functional vulnerability" value. This means its sedentary nocturnal and benthic habits make it similar to the herbivorous batfish, Platax pinnatus, in being a key organism for reef regeneration. Tropical trees are obviously the key for many other species, standing there as giants of the forest. Pouteria maxima is the most valuable species recorded for "functional vulnerability." It is only recorded three times in French Guiana. At 40m with 8m high buttresses, it must be an impressive site, if you ever see it! Thick and dense leaves join with plate like bark and fire-resistant woody tissue to make it a great survivor during frequent forest fires. It's liable to be a great maintainer of the forest structure as climate change affects Guiana. Another great survivor is the rare cliff-dwelling Saxifraga cotyledon. This spectacular species lives so long, again with thick dense leaves that it has time to slowly adapt to conditions that have altered dramatically over recent years. The flowers stand out on the cliff so insects may find it their only pollen resource during hard times. The champions of functionality are displayed below with the authors' own photographs. Species supporting some of the most vulnerable functions on coral reefs, in alpine meadows, and in rain forests. Above Images: (A) The giant moray eel (Gymnothorax javanicus (Muraenidae)), the largest of the moray eels, hunts by night within the labyrinth of the coral reef (B). (C) Saxifraga cotyledon (Saxifragaceae) is a low-growing, rare evergreen perennial plant, with long flowering stems that make it an important resource for pollinators on species-poor siliceous alpine cliffs (D). (E) Pouteria maxima (Sapotaceae), a rainforest tree with thick, coriaceous leaves and a wide buttressed trunk with thick bark, which may buffer the impacts of drought and fire predicted to occur more frequently for tropical forests (F). Photo credits ©: (A) M.J. Kramer, (B) J.P. Krajewski, (C) J.P. Dalmas, (D) W. Thuiller, (E, F) C.E.T. Paine. So many species were found in the datasets, that it's easy to imagine why only 3 systems were used. 1,390,000 fish from the South Pacific, belonging to 846 species were recorded, then they were released. Unfortunately, 213 spp. had to be eliminated because the samples couldn't estimate their abundance. In similar fashion, 2,535 alpine plant species were recorded and 662 tropical trees from 217 genera. Well done, science. Research is often distant and hard to understand, but the complexity of this work makes it important for all to understand. It is the rare ones that seem to be able to change or maintain the earth in the manner to which we have all become accustomed. And there's no other way to do it. Here's the paper in PLoS ONE, itself-fascinating!